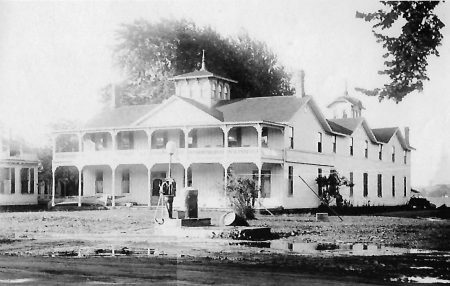 The Bay Shore House (and later the New Bay Shore House) was located across the street from where Krenzer’s Marine is now located on Greig Street. S. Gurnee has accepted the proprietorship of the Bay Shore House at Sodus Point, and will open the season May 1st. The law suit went down week be­fore last. J. H. Hopkin of Sodus Point, keeper of the Bay Shore House, had a man arrested for beating his board bill of forty-two dollars. After the arrest had been made he found the culprit had no money, nor any prospect of having any in the future. He did not want to send a man to jail that had vis­ited the watering place and enjoyed himself at the expense of a cripple and palsied man. Mr. Hopkins finally thought it best to let the suit go down. He wishes it understood, however, that he does not want any more boarders of that sort, for the more he has of them the worse he is off. F.S. Gurnee has taken charge of the Bay Shore House at Sodus Point. 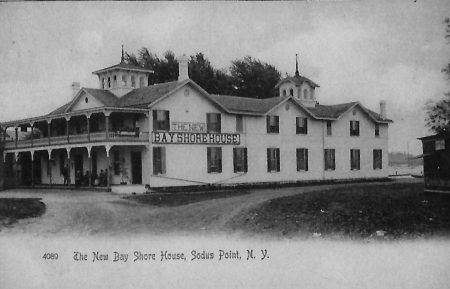 A B Sabin, Sr, of the Hotel Sabin, Wolcott, is preparing to assume the managementof the Bay Shore House, Sodus Point, in May. He will give the old summer-resort hotel a thorough overhauling, but no extensive carpenter work will be done. The idea is to make it clean and attractive without too great an expense to Proprietor Hopkins. Jason Underhill. of Butler, has been engaged for three months. Mr. Sabin intends to run the hotel on the European plan, and on a cash basis. He means to be able to serve meals at all hours. Sodus Point, N. Y. Under new management this year. one of the best at Sodus Point. Meals at all hours, American or European plans. maintained, making this hotel an ideal family gathering place.